The color purple is trending in 2018—you'll see it make its way into everything from cosmetics to upscale furniture stores, chic urban boutiques and more. Garden centers will be getting in on the action too, featuring some of your favorite flowers and plants in every shade from lilac to eggplant. Let's take a look at four ways you can color your garden purple this year. They say that "purple is the new neutral" and its true—this color has a way of naturally complementing anything you pair it with. Yellows and oranges provide acute contrast to make purples pop, while pink and blue pairings provide a smooth, harmonious look across the grouping. It's just a matter of taste how you like to pair your purples. For 2018, Proven Winners has awarded a perfectly purple National Container Recipe and three exemplary purple plants with their National Plant of the Year status. All of them offer beautiful ways to color your containers and garden spaces purple this year. Let's take a closer look. Lilac Festival kicks off the gardening season in spring with three shades of sumptuous purple. This exquisite recipe will bloom from spring into fall without the need to remove the spent blossoms, becoming fully rounded to trailing in shape as summer settles in. Full sun, consistent watering, and weekly feeding will keep it blooming beautifully all season. 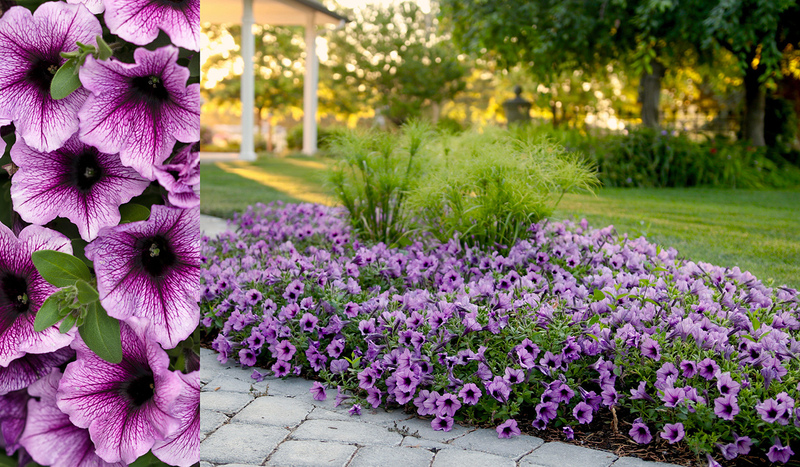 Supertunia® Royal Velvet™ Petunia--Dramatic purple flowers act like swatches of velvet sewn together to create an intricate tapestry. Through the seasons, it takes on a mounding to trailing shape as it artfully mingles with its neighbors. Superbena® Violet Ice Verbena--Adding a playful texture to the recipe, this large-flowered verbena carries parasols of pretty blooms on trailing stems. 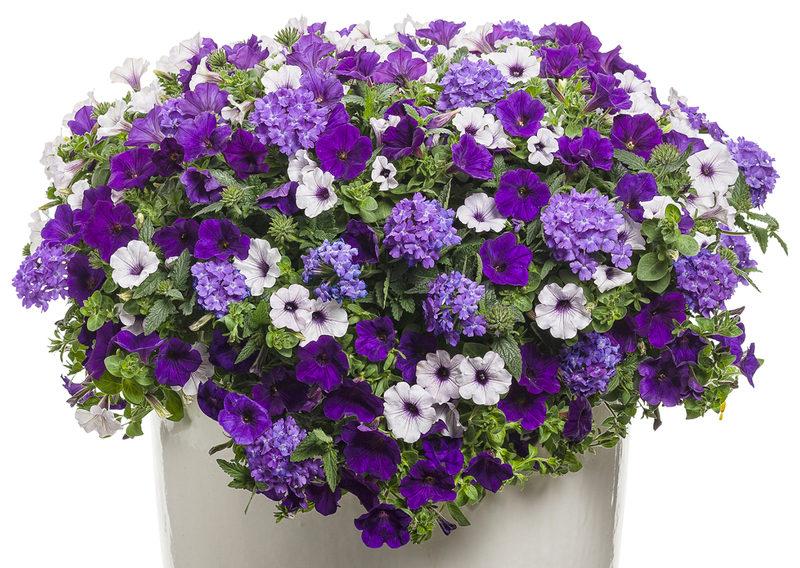 Supertunia® Mini Blue Veined Petunia--This mini petunia is the magic ingredient that makes the Lilac Festival recipe sing. Its colors echo its neighbors as it weaves its way through the container and in time, cascades heavily down over the sides like a silvery waterfall. It's a true "spiller" at heart. There's something about Supertunia Bordeaux that has made it a crowd favorite for many years. People who've grown it remark about its intricately patterned, lilac and deep purple flowers. They tell us it's easy to grow in full sun, light shade, hot climates and cold ones. We hear that it's one of the first flowers to bloom in spring and one of the last to finish in fall. So, we weren't surprised when over 5,600 people voted to make Supertunia Bordeaux the 2018 Annual of the Year. This petunia grows beautifully in upright containers and hanging baskets because of its full, mounded to trailing shape. Try growing it on its own in a 12" container or add companions in 18" or larger containers using these ideas. Since its stems will trail 30" long, choose a taller upright container or lift it off the ground onto a pedestal or plant stand. Supertunia Bordeaux is an amazing performer in the landscape, too. Its vigorous growth helps it quickly cover any empty, sunny space in the garden where its spreading stems will knit together to prevent weeds from moving in. Since each plant will spread 18-24", you won't need many to make a huge visual impact. 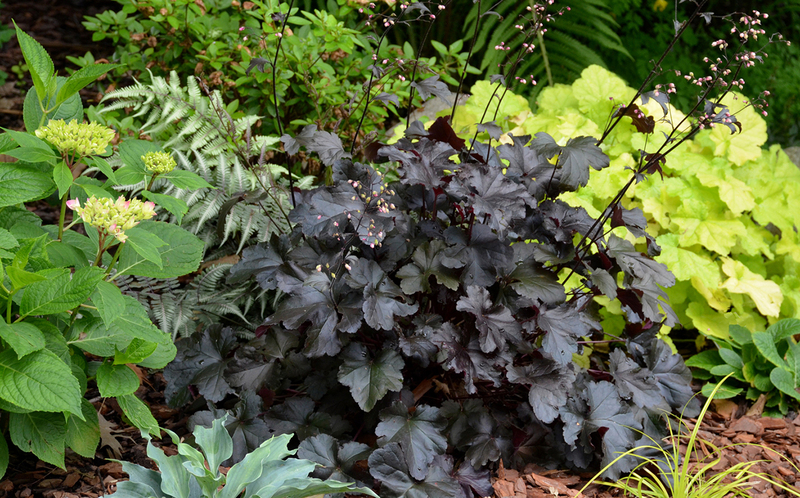 You might be familiar with purple coral bells, but none quite like Primo 'Black Pearl'. This robust variety is a true standout in the garden. Its delightfully ruffled, glossy leaves are almost jet black, even when grown in full shade, and they keep their dark color all season. Another thing that sets this variety apart is its remarkable vigor and full, densely mounded shape. H. villosa parentage, a plant native to the Southeastern U.S., contributes to its strong growth, and makes it naturally heat and humidity tolerant. It's cold hardy too, returning reliably every year in zones 4-9. Primo 'Black Pearl' grows best in part sun, but in very warm climates full shade may be needed. In cooler climates, it will grow in full sun if the soil is kept moist. It grows well in large containers and in the ground. When planting in containers, make sure to choose one that has a drainage hole. In the ground, amend your soil with compost or humus when planting to improve the drainage so the plant's roots won't sit in wet soil. If your garden is looking all too green, maybe it's time to add some Spilled Wine to your landscape beds. This low growing, 2-3' tall and 2-4' wide weigela shrub offers deep wine red foliage that holds its color all season. A bright floral bouquet of magenta pink flowers blankets the foliage every spring. Butterflies and hummingbirds enjoy their nectar. 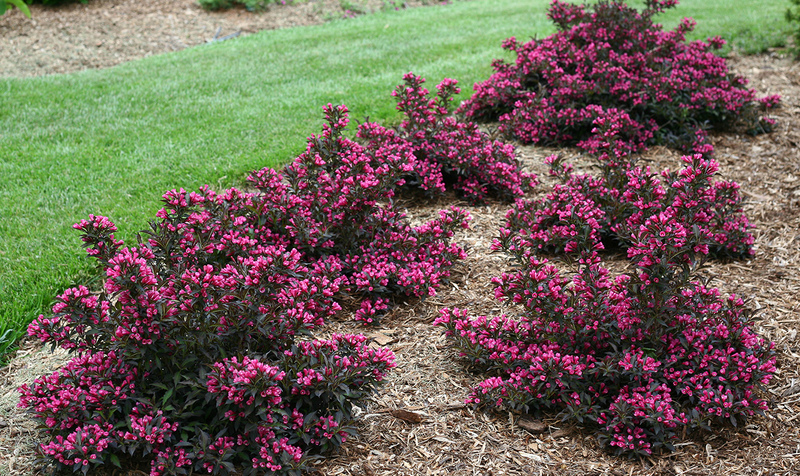 Spilled Wine weigela is just the right height for planting under windowsills without the need for pruning or planting en masse in low maintenance landscape beds. You won't need to worry about deer—it's not on their list of favorites. Like a complex wine, this shrub embodies a certain richness and intensity that may look complicated, but there's really nothing to it. It adapts to most soil types, including clay. Giving it 6+ hours of sunlight, average water (about an inch per week), and a bit of slow release tree and shrub fertilizer in early spring will help it thrive. This shrub is reliably cold hardy in zones 4-8. Learn more about the National Plant of the Year program from Proven Winners at www.nationalplantoftheyear.com.